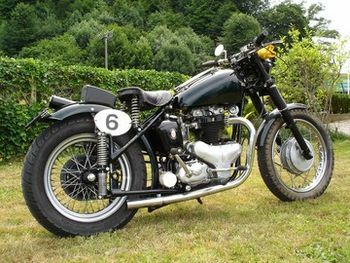 While never having the popularity of the Triumph twins, the BSA twins were very well engineered and in many respects easier to service than the Triumph's. These A7 twins were quite versatile, from winning the Daytona 200 in the early 1950s to competing in the International Six Days Trials. 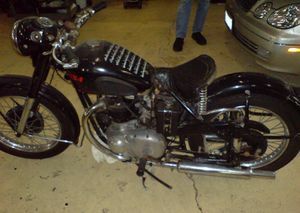 At this point in time, BSA were the largest producer of motorcycles in the world. 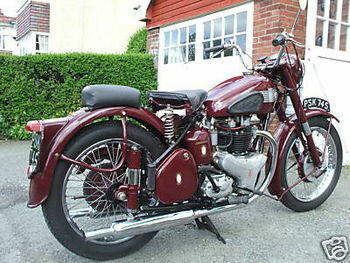 The launch of the Triumph Speed twin, designed by Edward Turner, had caught the rest of the industry napping in 1937 and because the war came along when it did it gained a head start on other players in the field. 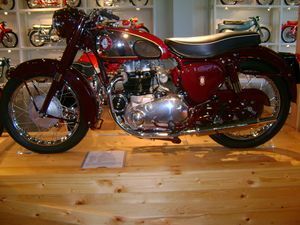 BSA was one of those players and it was in a position to rapidly design its response to the Speed Twin. Employed at that time by BSA was a man Val Page, who had whilst at Ariel and Triumph, worked on his own designs for twins. He therefore could be described as the father of the modern twin. Although it took Edward Turner to make the result a best seller. The A7 had its wheels firmly planted in the prewar twins which would have made their appearance in 1940 had not the war intervened. During the summer of 1939 visitors to the works would have occasionally seen one of the development machines out on test. BSA followed two distinct lines with their first prototype twins. There was the 500cc twin with its OHC motor which, it was hoped, with its 100mph potential would have given the Tiger 100 a run for its money and a 350cc twin aimed squarely at BSA's traditional role with OHV and straight forward construction. BSA knew that their traditional buyer expected reliable if uninteresting performance. So it is not surprising that these machines were not the most sprightly or attractive of the vertical twins but it was certainly the most hard wearing , oil tight and quietest, running with a minimum of whine or clatter. The overall design concept laid down in the late thirties stood the test of time, for it survived up until the end of the A65's. All used a 360 degree twin cylinder format and all had the single camshaft located to the rear of the cylinder working pushrod operated overhead valves. The patent taken out in 1945 stated that the single camshaft was chosen to save on both material and labour costs. The rest of the industry did not agree apart from Norton but they chose to mount theirs at the front of the cylinder and drove it by chain. In September 1946, for the 1947 season, the A7 was announced and went on sale to the public in November of that year. The first engines, which were to be used up until 1950, were based on the 62 x 82 mm bore and stroke. which gave a capacity of 495cc. The early engines are most easily recognized by their screw-in rocker box caps. One unusual feature on the prototype engines was the arrangement of the crankshaft. This was built up from three sections and would have allowed the use of one piece rods with lead bronze bushes. Each crankpin was extended and tapered to fit a corresponding hole in the central flywheel. The three parts were drawn together by a very special bolt fitted from the right and machined with a differential threads, that is, two threads of different pitch , the nett effect was to give the bolt a very fine pitch and so high clamping power, but to retain the normal thread section and strength. The construction concept can be found on Scott engines using a normal clamp bolt while the differential screw is used in Hirth crankshafts which are built up from individual components locked together with radial teeth. This complex and expensive design was dropped in favour of convention by the time units reached the public. The rocker boxes were separate alloy castings each retained by five fastenings. Each pair of rockers ran directly, without bushes, on a long spindle across the box which was supported by an internal rib in the centre and secured by a dome cap nut on the right-hand side. Early models relied on oil mist lubrication but from early 1948 the shafts were drilled to take a positive oil feed taken off the oil return pipe. This form of rocker cover design was arrived at after many different arrangements had been investigated. One such design was for a one piece cover over the whole of the valve gear. Accessibility would have been great and would have dispensed with the pushrod comb, so beloved amongst A7/A10 owners, however the problem of keeping such a cover oil tight was beyond the 1940's technology. Fifty years later such covers are common with OHC engines which have a much more copious supply of oil. The cylinder head was formed as one casting with a separate manifold bolted to it, to which the carburettor was bolted. Originally there was no drip tray but after several fires this essential piece was designed to take the petrol drips away from the sparking magneto. The cast iron cylinder barrels were deeply recessed into the crankcase mouth with the pushrod tunnel cast in and the head attached to it by nine bolts with a copper and asbestos cylinder head gasket fitted between the two. The crankcase was along traditional lines being split vertically on the centre line of the engine. The left half being extended back to form the inner section of the primary drive case whilst carrying the ball races which located the crankshaft. The right case was smaller with a small rearward piece to carry the magneto and two semi circular supports for the dynamo. The timing side bearing was steel with a white metal facing. Combined the bearings gave the bottom end a life expectancy in excess of 30,000 miles provided the oil was changed frequently. The inner timing cover was a casting to space out the outer casing from the crankcase. The case was divided into three areas. One was to contain the dynamo drive as a self contained area to keep the grease filled dynamo drive from the second which contained oil mist lubricated timing gears. Finally the lower area of the case fitted over the oil pump and drive. The hole through which the dynamo was driven was sealed by a cork washer and the dynamo chain was adjusted by rotating the body of the dynamo and tightening the retaining strap. The cover also contained the timed breather which was driven off the camshaft drive pinion. The breather was packed against the inner cover by a cork sealing washer. These areas were sealed off from the outside world by a cover the shape of which set off the whole engine and was to become a characteristic of the whole range. Although the famous stacked rifles motif did not appear until a couple of years later. 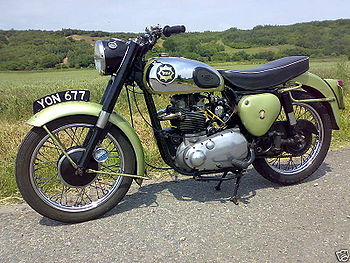 The drive side consisted of the usual BSA twin lobed cam-type shock absorber but had a duplex chain . When first announced it was proposed to use a triplex chain for overseas models but this was only done on the later A10 Super Flash models, all the rest had duplex chains. The clutch was a self contained dry unit within its own cover. This arrangement was very critical of the oil level in the primary case. Too critical for anyone doing a high mileage. If the level was too low then the chain and the slipper tensioner suffered, too high and the clutch started to slip. This was quickly cured by the enthusiast who had the friction plates fitted with corks, filled the chaincase well above the normal level and had no problems. The gearbox was the Achilles heel of these early twins. Instead of moving only one gear, BSA moved the centre pair of gears. Also the engagement dogs on the gears were rather too numerous too produce a quick change box. It was not bad but fell some way short of the best in terms of feel and slickness. When Bert Hopwood came to BSA in 1949 one of his first tasks was to improve this gearbox. The engine and gearbox unit were housed in a rigid frame made up from tubing brazed into forged lugs, the normal practice at the time. At the front was the BSA telescopic front forks which were amongst the best at the time. It was fitted with a single saddle with oil tank located to the right underneath the saddle. On the opposite side was the battery carrier. The toolbox was located between the chain stays and therefore was a triangular shape so beloved by BSA. This meant it was almost completely useless to carry anything in apart from a segment of cheese! Both runs of the final drive chain were equipped with chain guards. The wheels were interchangeable however by 1948 the front wheel was located by a more conventional design and was no longer interchangeable with the rear. The real oddity was the stand. This device was a combined main and propstand. It was telescoped up the seat tube where it was retained by a tension spring. On paper it must have looked a good and neat design. All the rider had to do was to press the peg on the end of the stand down until its ratchet was released by moving a small lever. However, in practice, it had three major drawbacks, the first was to make the machine stable the machine had to be lifted a little to bring some weight on to the stand, this was very similar to hauling yourself up by your bootstraps. The second was it was susceptible to little fingers, what was an easy exercise when putting it on to the stand would then form an irresistible urge to every small boy for miles around. One touch on the small lever and the stand would retract, leaving the bike to fall over. Thirdly and potentially the most serious for the rider, was if the retaining spring broke then the stand would fall down and because it was angled forward would become a first class sprag. At least with a conventional stand when the spring breaks, it clatters along the road for a while before throwing the rider down the road at the first raised manhole cover. Therefore the odd centre stand was dropped pretty quickly in favour of the conventional in the first year. When launched the A7 delivered 26BHP at 6000 RPM and the price was listed at £135 plus £36.9s.0d. purchase tax with a further £5.1s.7d. for the speedometer which was listed as an extra but was a legal necessity. All told the new BSA twin looked well and compared favourably with the only other twin then available, the Triumph. It look sufficiently similar to overcome the conservative nature of the motorcyclist but was sufficiently different to distinguish it as a BSA with its distinctive tank and timing cover. These early machines continued on until 1950 when a new larger capacity twin was announced called the A10 Golden Flash. This was soon followed by a new A7 produced by reducing the new twins bore and stroke. Many parts were interchangeable with its big brother but few with that of this earlier long stroke machine. How to recognize the A7 and Sporting variants Note where years are given they are BSA seasons usually running from August of the previous year through to July in the following. 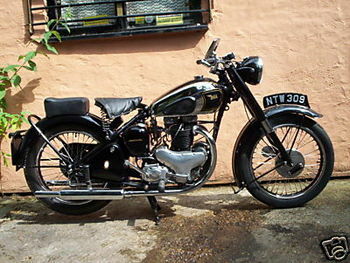 So although the A7 was launched in October 1946 that was the BSA 1947 season. Oct 1946 XA7.101 XA7.101 A7 twin introduced, rigid frame with telescopic front forks, 7 inch (1947 season) brakes 31/2 gallon tank. Speedo in tank and special centre stand fitted. During the year normal type of centre stand fitted and oil feed to exhaust rockers added. Black frame, chrome tank with three painted panels one on top and one either side in front of the kneegrips in black lined with double gold lines. Winged BSA tank badges. Wheel rims were chrome with black centres lined with single gold. Alternative finish devon red, although the despatch books don't record any of the first years production being so finished. 1948 - YA7.101 YA7.101 Speedo on fork top. Finish as 1947 devon red now appears in the despatch books and catalogues specify when available. 1949 - ZA7.101 ZA7.101* Two part frame construction to allow for rigid and plunger. Left front engine plate pierced for dynamo. Colour as before. ZA7.101 ZA7S.101 Spring frame with plunger rear suspension optional extra. ZA7S.101 ZA7S.101 A7 Star Twin introduced. As A7 but with slightly higher compression motor, twin carbs, spring frame as standard. Finish as A7 but with matt silver tank panels double lined in maroon, special Star Twin transfer. Wheel rims chrome with matt silver centres lined in maroon. 1951 - AA7.101 ZA7R.6001 A7 twin. Redesigned motor with new cylinder head and rocker box, AA7.101 ZA7S.14001 modified crankshaft, alloy con rods and additional oil supply to the camshaft trough. Finish as before. AA7S.101 ZA7S.14001 A7 Star Twin as A7 but with high compression pistons, single carb. 8 inch front brake. Finish as before. 1952 - AA7.5001 ZA7S.26001 A7 twin. Improved mechanical breather, underslung pilot light. Rigid frame deleted from range. Finish as before. 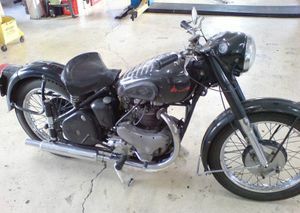 AA7S.1001 ZA7S.26001 A7 Star Twin as A7 but with manual ignition. Finish as before. Metal Star Twin badges on petrol tank**. 1953 - BA7.101 BA7S.101 Headlamp enclosed in cowl containing speedo, ammeter and lighting switch. Boxed in rear number plate. 8 inch front brake. Finish now all over maroon with chrome tank side panels with gold lining. New metal tank badge with circular portion containing winged BSA and 'lightning flash' back to kneegrip. BA7S.101 BA7S.101 A7 Star Twin. Modification as per A7 but finish now dark green frame and hubs with light metallic green elsewhere. The petrol tank light metallic green with chrome sides lined in dark green. New round plastic badge probably with pale green background. Brake back plates chrome plated. Dec 1953 - BA7S.2559 BA7S.12895 A7 Star Twin production stopped. July 1954 - CA7S.303 CA7.5948 A7 Star Twin swinging arm frame discontinued. The vast majority of these machines were exported to Sweden. 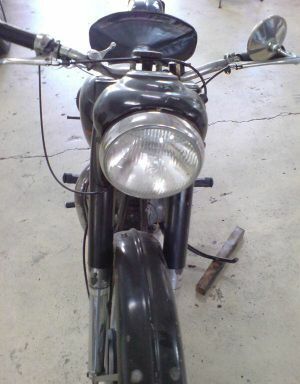 1955 - CA7.1501 CA7.7001 A7 as above with pilot light in the reflector, steering head lock, new monobloc carb. Finish as above. CA7SS.501 CA7.7001 A7 Shooting Star as A7 above. Finish as A7 Shooting Star above. June 1955 - BA7.2741 BA7S.16787 A7 Spring frame production stopped. November 1955 - CA7.2701 EA7.101 A7 twin as above but now with alloy Ariel type hubs and backplates. Brake crossover shaft in the swinging arm pivot. Finish as above with black as an option. CA7SS.2301 EA7.101 A7 Shooting Star as A7, integral cylinder head and manifold. Finish as above. Oct/Nov. 1957 - CA7.5001 FA7.101 A7 replacement of alloy hubs with cast iron version, improved clutch and silencer, new headlamp cowl and roll on centre stand. Finish black frame, forks, chainguard, hubs, hub cover plate centre and brake plate centre. Rims of last two chromed and polished respectively. Princess grey mudguards, mudguard stays, oil tank toolbox, air cleaner box, and petrol tank, which has chromed side panels lined in red. Black option available. CA7SS.4501 FA7.101 A7 Shooting Star as A7 but with 8 inch front brake, no air cleaner. Finish in same style as A7 but with metallic green in place of princess grey. Tank lining dark green. Sept 1959 - CA7.7101 GA7.101 A7 modified rear brake, new design of mudguard, front has a separate fixing for the number plate, pear shaped tank badges with red background. Finish as above but with devon red in place of princess grey. CA7SS.6701 GA7.101 A7 Shooting Star as A7. Finish as above but background to tank badges black. Sept 1960 - CA7.8501 GA7.11101 A7 as above. Finish as above apart from the brake back plates which remain in alloy with polished rims. Devon red now referred to as fuschia red. CA7A.8501 GA7.11101 A7 alternator model chiefly for police use. CA7SS.8001 GA7.11101 A7 Shooting Star as above . Finish as above. Sept 1961 - CA7.9714 GA7.21120 A7 as above .Finish as above, fuschia red now referred to as royal red. CA7SS.9277 GA7.21120 A7 Shooting Star as above. Finish as above. May 1962 - CA7.10020 GA7.23137 A7 discontinued. CA7SS.9343 GA7.23021 A7 Shooting Star discontinued. This page was last edited on 20 January 2011, at 20:43.